"Gentlemen of the press: "Harry Houdini has done it again!" Harry Houdini and Sherlock Holmes are two very familiar characters in history. They've each made their name for different reasons and both of them have specific personality traits that endear readers to them. What if the two of them came together though? 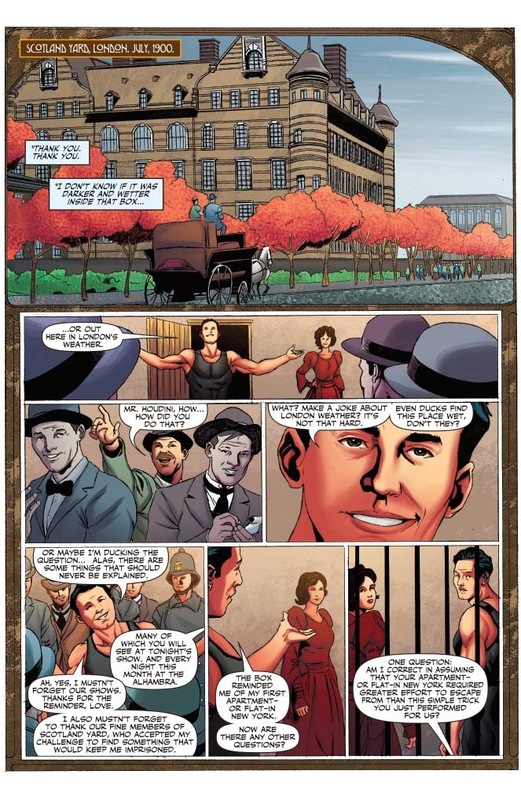 Dynamite Entertainment seeks to answer it in Sherlock Holmes vs. Harry Houdini #1. 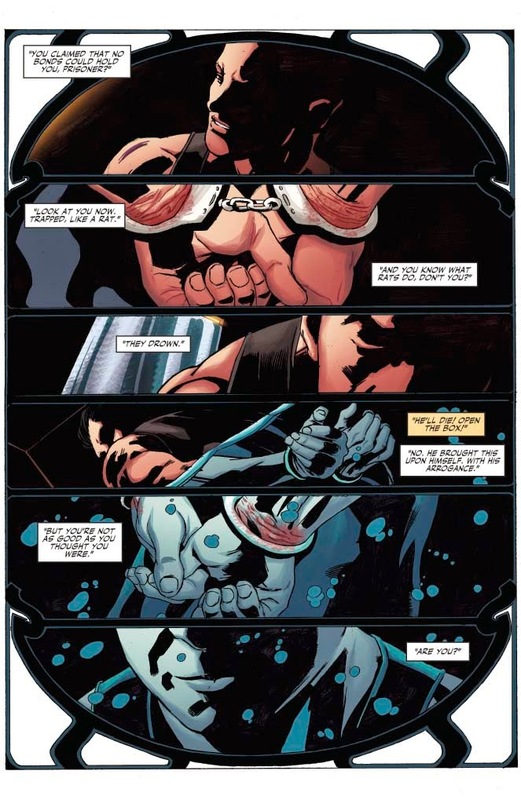 The issue is written by Anthony Del Col and Conor McCreery, illustrated by Carlos Furuzono, colored by Aikau Oliva and lettered by Rob Steen. The world's most famous detective meets the world's most famous magician...and death ensues. Famed detective Sherlock Holmes and brash showman Harry Houdini must combine forces to defeat a mysterious mystic dedicated to destroying Houdini's career and killing anyone who gets in his way. And Houdini's illusions will prove to be representative of a few conundrums that may prove a little taxing for even the great Sherlock to unravel. 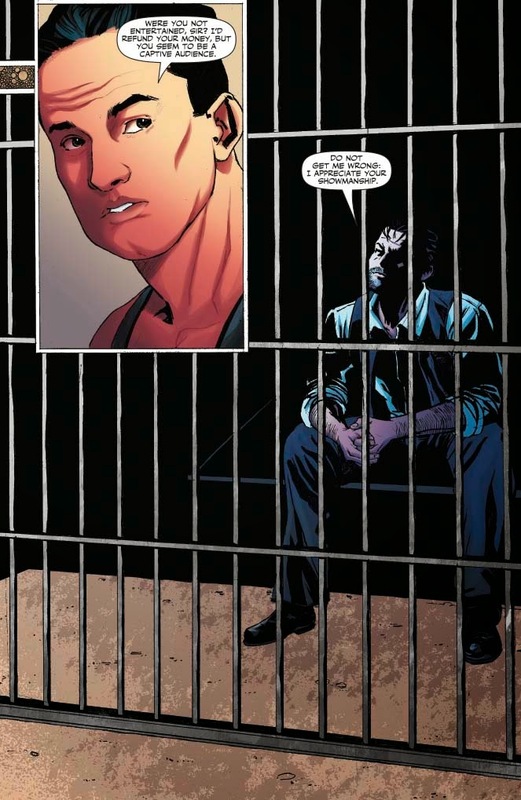 Sherlock Holmes and Harry Houdini are extremely familiar to just about any reader, which really helps readers jump into Sherlock Holmes vs. Harry Houdini #1 with both feet. Del Col and McCreery present both characters in ways that tap into the characteristics that make them who they are. The dynamic between the two is also pretty explosive, with Houdini's brashness clashing with Sherlock's arrogant intelligence. Adding a spiritual twist to Houdini's performance is pretty interesting as well and adds a rather refreshing take on both somewhat tired characters (from a usage standpoint). 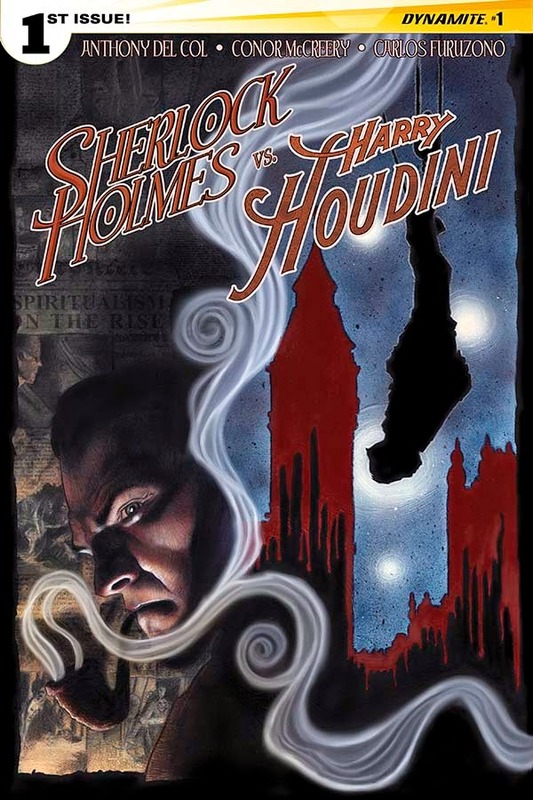 The story plays out at the intersection of Houdini's mystical reputation and Holmes' propensity for pursuing the more intriguing mysteries. The rather antiquated settings of the book further thrust Houdini and Sherlock into their shared world. 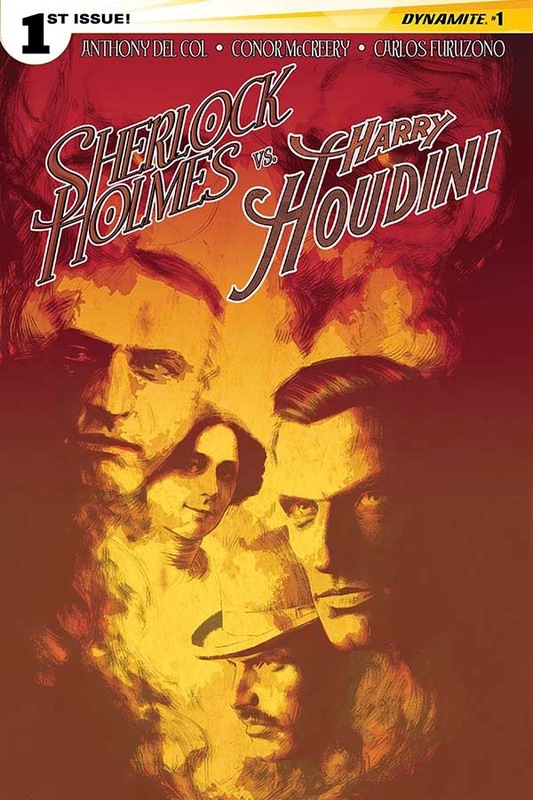 Both Houdini and Sherlock are illustrated with a lot of masculinity, showcasing the traditional strong features that make them defining male characters in literature and history. The pages are a little busy when it comes to the panels, as Furuzano packs a lot onto each page. The panels are framed by some rather interesting borders that help the book feel more Victorian and as if you're leafing through a scrapbook of their adventures. Oliva's colors offer a relatively flat feel to the book and there are a few instances where color is used as a means of amplifying the action on the page. 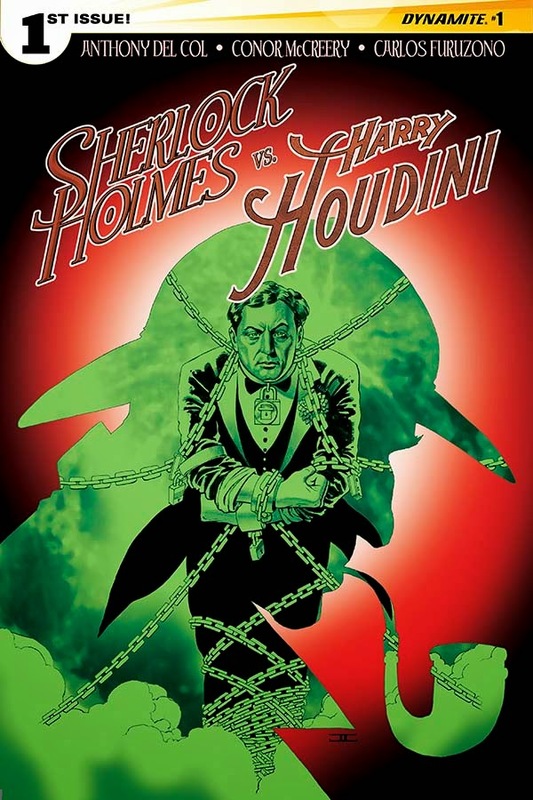 Sherlock Holmes vs. Harry Houdini #1 is a pretty fun mash-up boasting two extremely strong and well-known characters. The concept breathes some fresh air into both characters, spinning their best characteristics into a sort of battle of the wills between the two. Del Col and McCreery draw upon some of the more recent incarnations of the characters to give readers a foothold into the story that weaves the two worlds together. Furuzono's illustrations are very appropriate for the work, presenting a London full of mystery, magic and mentalists. 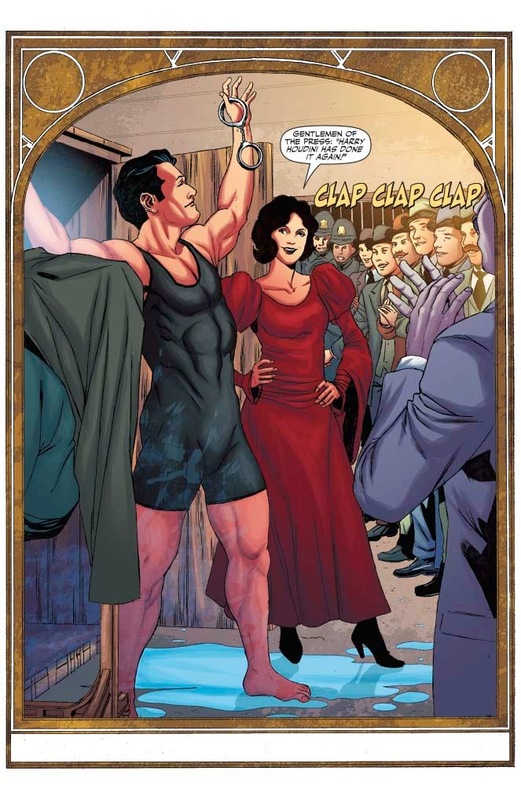 Sherlock Holmes vs. Harry Houdini #1 is unique and could be a pretty zany story bringing the two fabled characters together. 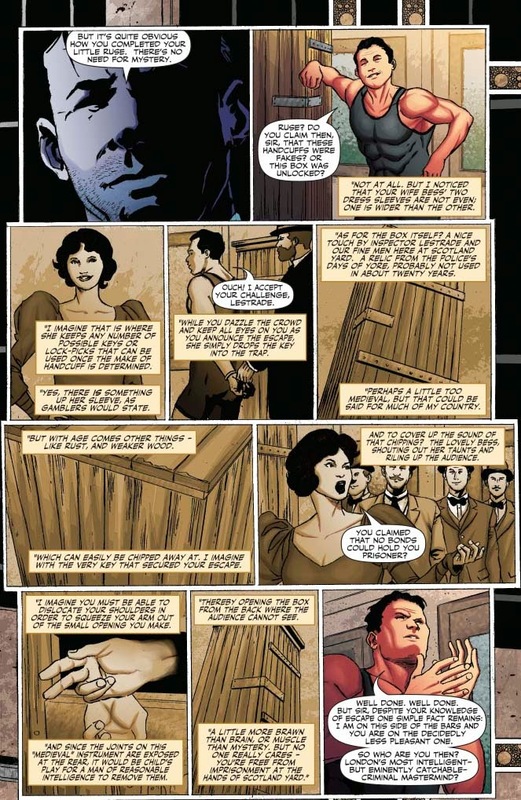 Sherlock Holmes vs. Harry Houdini #1 is in stores October 1 with interiors below.